Featured Item: Organic Cashew Butter 16oz On Sale In July!!! It is our delight to show you how simple it is to make your own almond milk. So much better than what’s been sitting on a store shelf. Think of the fruits and berries that you’ll add. I want to thank you for the very excellent products I received just before the weekend. As always, almond butter that no one else can compete with and sesame seed butter that is comparable to none. Both absolutely fabulous products . As well, thank you for my elder gifts of raisons and olive oil. When I opened the olive oil, its fragrance, so unique to a particular olive in California, was perfume for my day; its flavor, had a familiar bite and was lovely. The raisons, quite a cut above any available elsewhere, should keep my sweet tooth in check for a while. We invite you to share the wonder of your garden with brothers and sisters. Tell us of your triumphs and successes with sweet corn, cucumbers and tomatoes. Share the joy and deep satisfaction you receive upon harvesting the fruits of your labor. Tell us of the salads you create from lettuce, chard, kale and parsley. We are offering as a prize a $150 gift certificate. Put it all together as a video walking tour. Contest ends August 6th. A $18.99 Value – Yours for $16.99!!! This Cashew Butter is sweet and creamy. It’s made from Organic Cashews and our raw Organic Almond Oil. It’s perfect with when paired with cucumbers, celery or even peppers. It’s also a great topping for fruits and desserts. What a delightful way to add some variety to your lunches! These beautiful dates are a vitalizing treat as a dessert or snack. Firmer and with more depth of flavor. Pack them along when traveling or hiking. Its easy to remove the pits and use for a wealth of culinary applications. Great addition to school lunches. Grown by California Family Farmers. We produce this almond meal from our California almonds grown by family farms. Rejoice in its moist, oily aliveness. What wonderful raw, alive cookies and cakes you will make! Combine with honey, chopped dates and raisins for a raw, alive pie shell. You’ll think of so many other creative uses! We invite you to set sail for the expanses as you take a taste of our sublime Organic Chocolate Coconut Barque. Alive, organic coconut embraces the very best alive, organic chocolate in this exceptional treat. We have added organic vanilla powder and coconut sugar to bring out the rich and delicate flavor of our alive cacao. Crispy organic quinoa puffs ensure a slight and satisfying crackle and crunch with each bite! Take a deep breathe, open a pack of Living Tree’s Chocolate Coconut Barque, and relish in the surprising and delightful taste and texture of this unique dessert. (Mercola) Most people are familiar with turmeric (scientific name: Curcuma longa1) as a yellow spice that’s used in Indian cuisine and has a peppery, warm and bitter flavor. 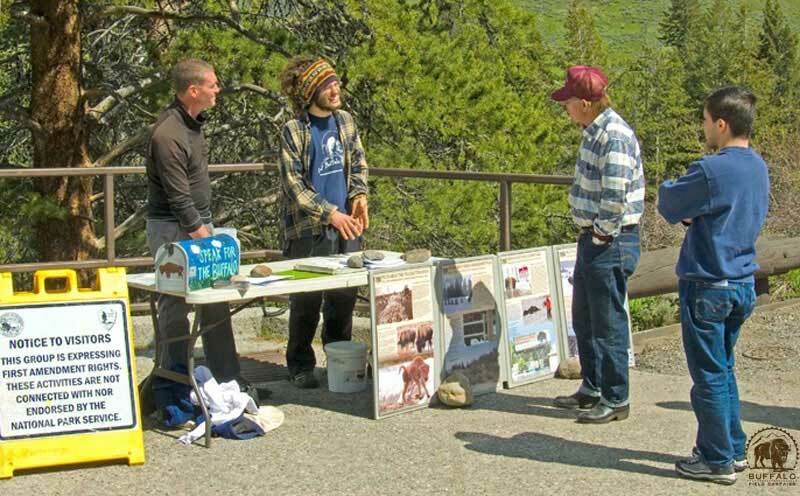 Tabling inside Yellowstone on behalf of wild bison, when volunteers spend the bulk of their time in the park talking with visitors, is one of our most important summer jobs. Time and again we are reminded how important it is for us to be there, to share the buffalo’s story with the hoards of people who come from around the world to see them. Most people we talk with have no idea what Yellowstone and Montana are doing to these gentle giants during the long winter months, and when they find out how our national mammal is being treated, they are ready to take action. Summer tablers have been dispensing critical information, gaining advocates for wild buffalo, and filling up petitions addressed to Montana Governor Steve Bullock urging the state to endorse a new plan that respects wild buffalo like wild elk in Montana. When these visitors next encounter Yellowstone park rangers, they will be much better informed should conversations turn towards the buffalo. The importance of speaking face to face with the thousands of people who have come to see the buffalo can not be stressed enough. Conversations that our tablers have with so many visitors brings a variety of perspectives ranging from the outlandish and inaccurate to the informed and passionate. While some people seem predisposed to not liking buffalo and believing they should be kept like pets in Yellowstone, most people we speak with are ready to do what they can to help the buffalo.